It's not uncommon for a dog to lose a lot of hair after she gives birth or when she's nursing puppies. For an owner, seeing this sudden hair loss can be frightening, but as long as there are no other symptoms that may indicate health issues, it's perfectly normal. It's known as "blowing her coat" or telogen effluvium. Hair grows in cycles: there's a growth phase, or anagen; a phase when the hair stops growing, catagen; and a resting phase, telogen. 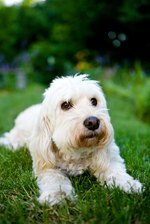 Different areas of a dog's coat may not be in the same phase of hair growth. From the stress of giving birth and nursing, hair can enter the resting stage, so it may all shed at one time. Hormonal changes also may affect hair loss. Dogs may lose hair in large clumps, which can leave some areas completely hairless. The skin generally appears completely normal. The hair loss commonly occurs symmetrically on the back, sides and flanks. It may occur up to three months after a dog gives birth. Hair that is falling out may become matted and provide a breeding ground for bacteria or other microorganisms that can cause skin infections. Regularly brushing the dog's coat will help remove trapped hair and keep the coat from becoming knotted. It also will help speed up the shedding process and help reduce the amount of hair that falls out around the house. A pregnant or lactating dog should be on a diet that addresses her special needs. Vitamin supplements may be prescribed by your vet that will help reduce the hair loss. A blown coat will grow back. It may not look the same as the coat that fell out, but it will regrow after a few months. The new coat may appear darker and thinner, which can also appear as though the dog is losing more hair than she really is. The hair may have a different texture than the hair that fell out. On dogs with a topcoat and an undercoat, shedding may be more pronounced. Excessive shedding also can be caused by extreme stress. If hair loss continues for more than three months after a dog gives birth, it could be due to other factors. Check with your vet to make sure that your dog's hair loss isn't related to something other than breeding and lactating.